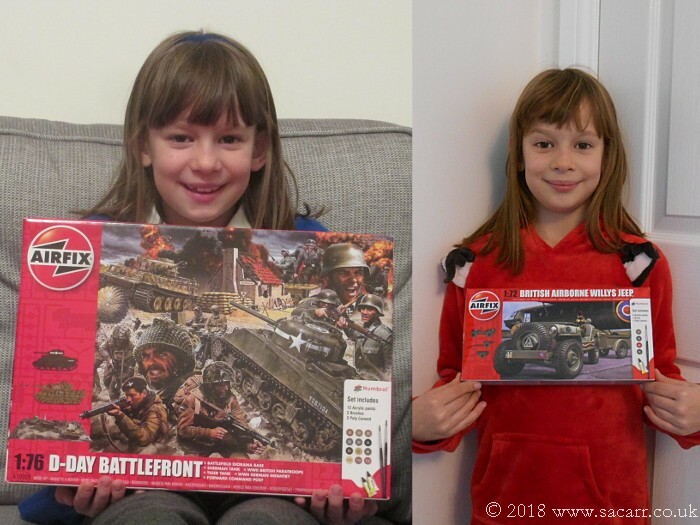 My daughter and I won one of the Airfix Christmas competitions in 2017 and the prize was the D-Day Battlefront set. 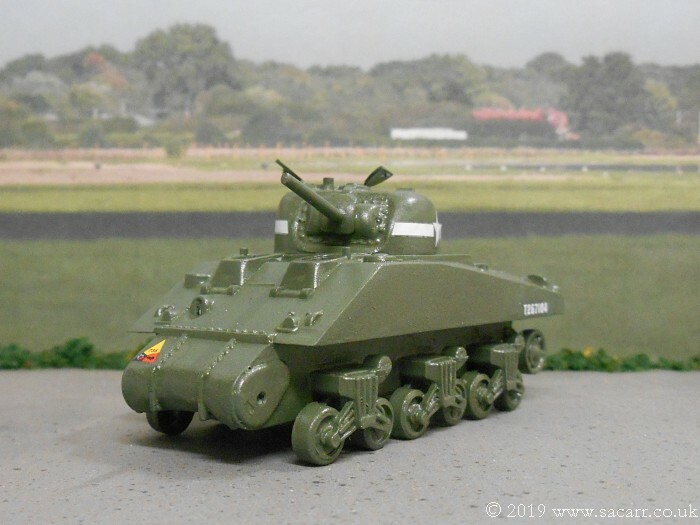 Due to other modelling projects, it's taken until now to get it on the bench. 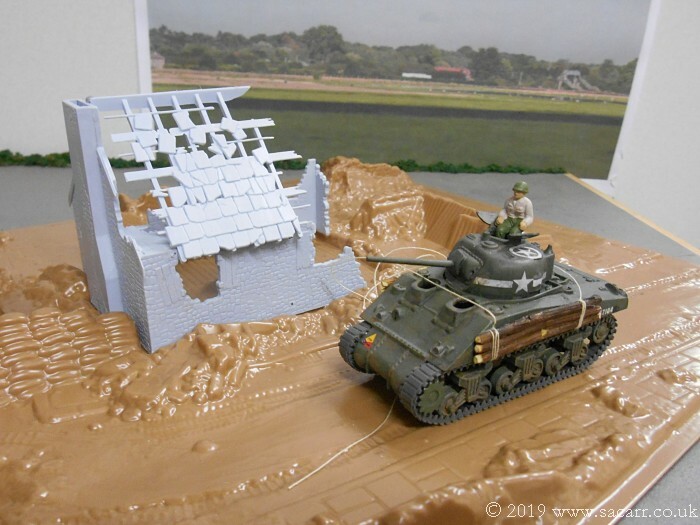 In mid December 2018, we were thinking about the layout and considered it unrealistic to have a Sherman and Tiger that close together, without one being blown into a thousand pieces! 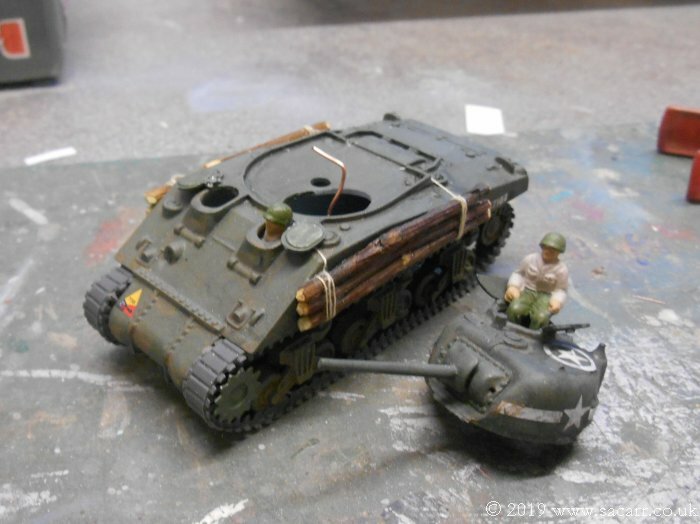 So we decided to save the Tiger for another diorama and replace it with a Willys MB, which were being sold cheap at the Aldi supermarket. 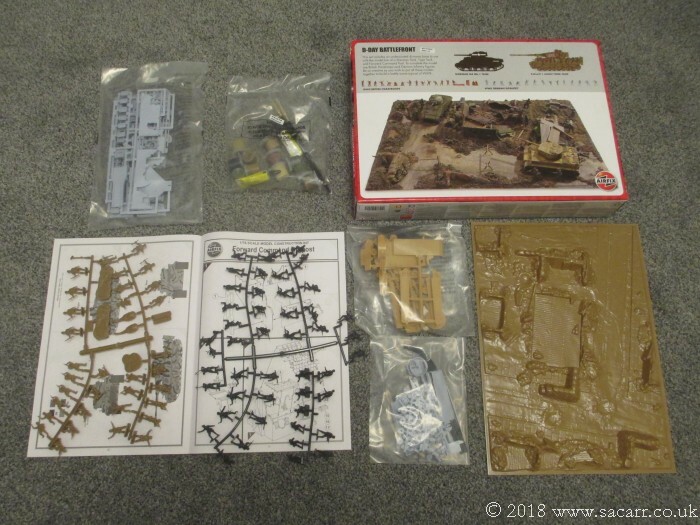 Here's the contents of the basic D-Day set. 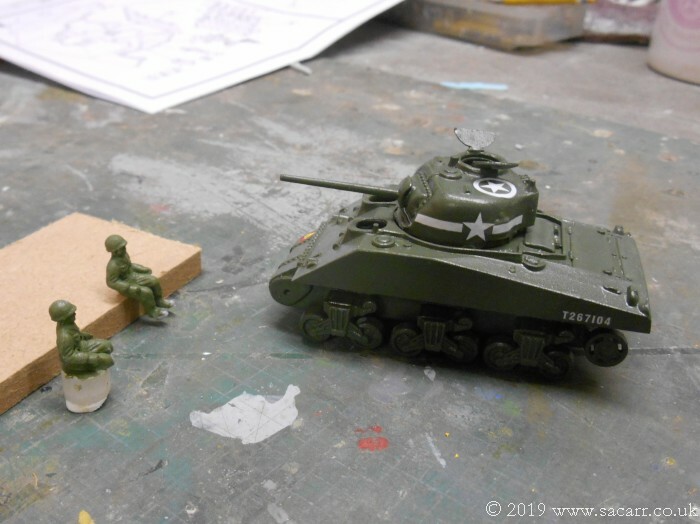 The two tanks, house kit, vac-formed base and those horrible rubbery plastic figures. Still, she's made a good job on all her previous models, with a lot of guidance, so I have high hopes for this one. 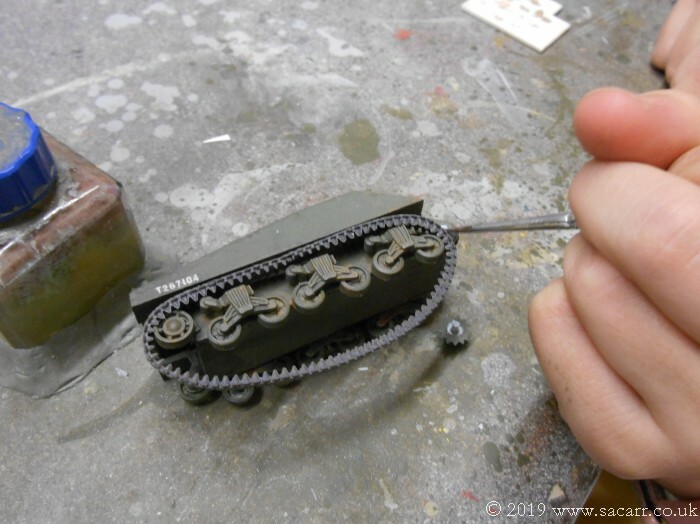 On December 19th, after school, we made a start on the Sherman. Wheels and suspension first. Assembling the suspension units was a bit fiddly. 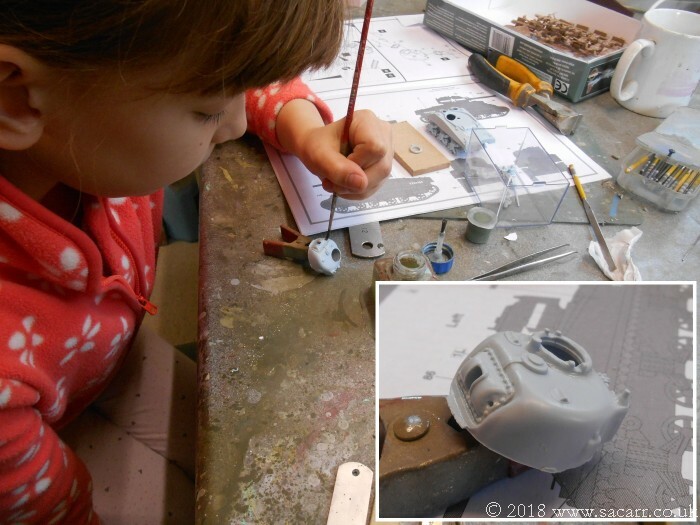 All the wheels needed their centre holes enlarging or centering as the moulding wasn't great, so my daughter did that with a needle file while I looked at the suspension arms. 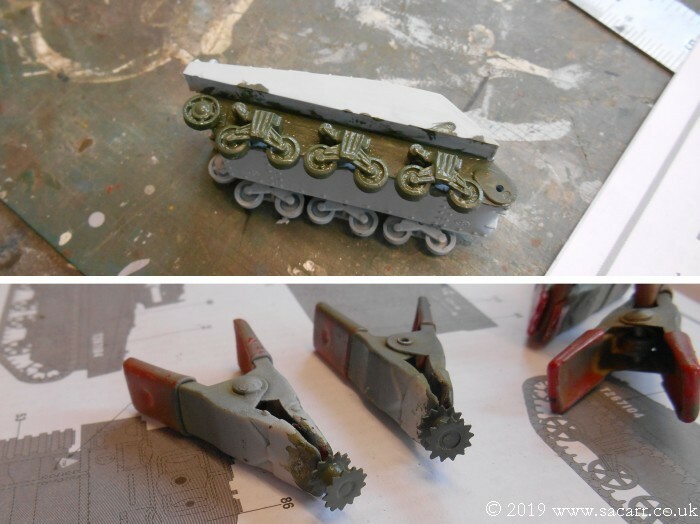 The rear arms wouldn't fit over the axles and the shallow hole in them was quite close to the edge of the moulding, leaving little plastic to drill out. So each axle had to be tapered slightly so that it would fit the shallow hole in the rear arms. 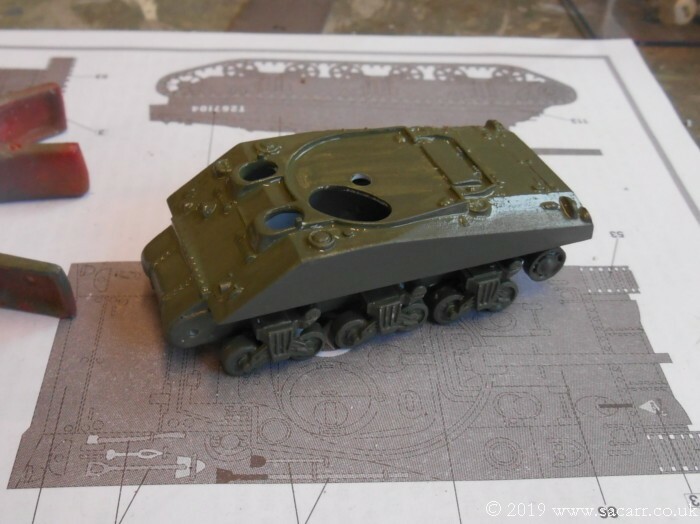 The kit instructions call for them to be assembled and fitted to the hull, but I think we'll leave them off at least until the wheels and chassis area have been painted. While those were drying, we turned out attention to the hull. 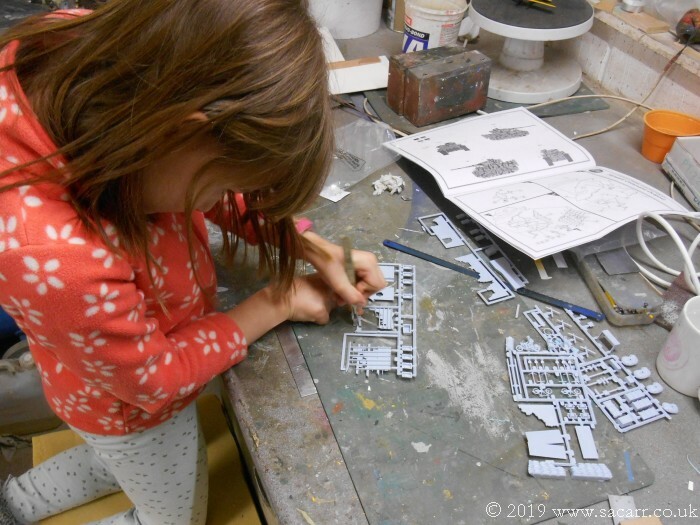 Sometimes I have to assist with the parts cutting, as on some of the thicker sprues, my daughter just doesn't have the strength to cut through them, and often the part size, shape and position on the sprue wont allow cutters to fit the space. 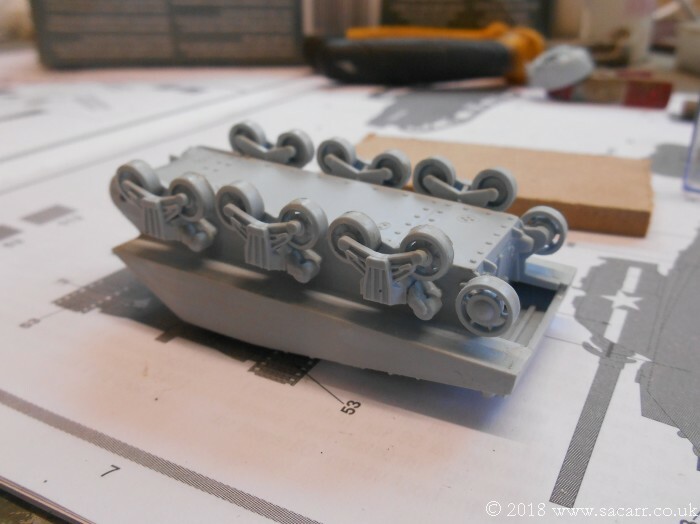 Once the bits were cleaned up, the lower hull was assembled. 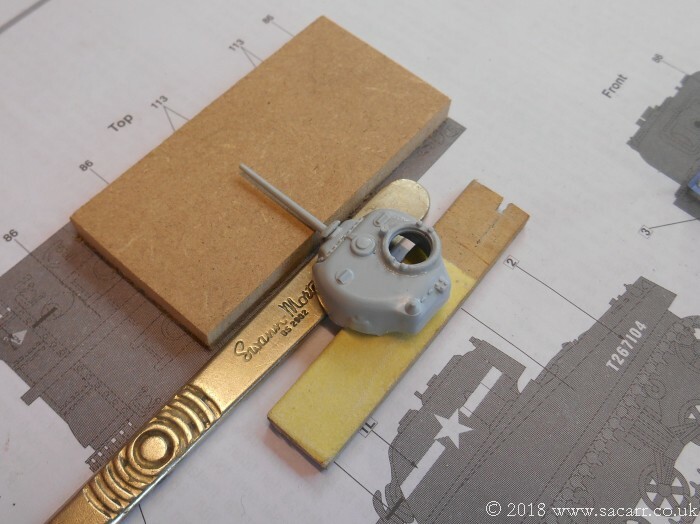 The turret parts were cut out while the hull dried for a bit and then the upper hull was attached to the lower hull and that was the end of the first day. At my daughter's request, we had another modelling session after school on December 21st. 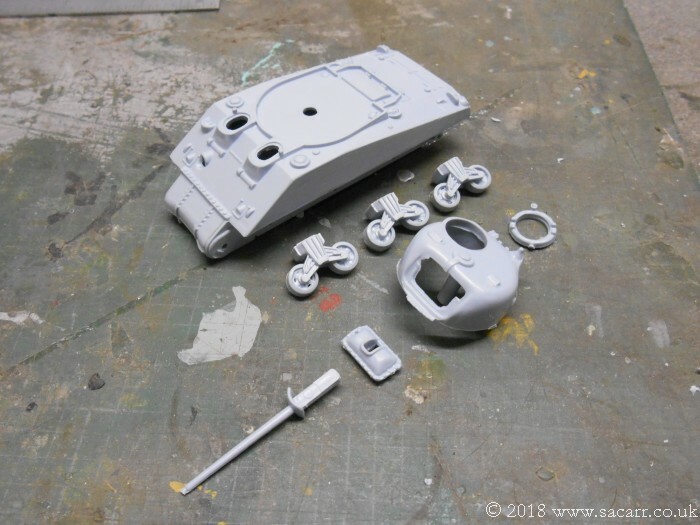 We had discussed fitting the small support wheels at the top of the track first, then painting the area behind where the wheels would fit, followed by fitting the main suspension units. 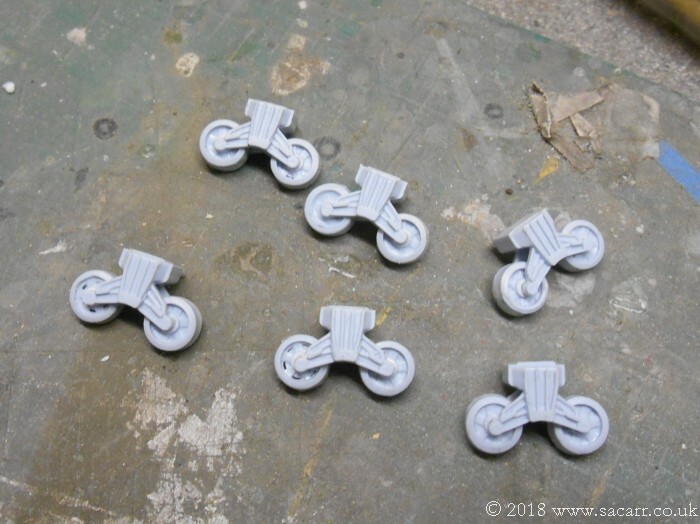 After looking at how closely the two parts fit, there was a good chance the small support wheels would stop the main units from fitting if slightly mis-aligned. 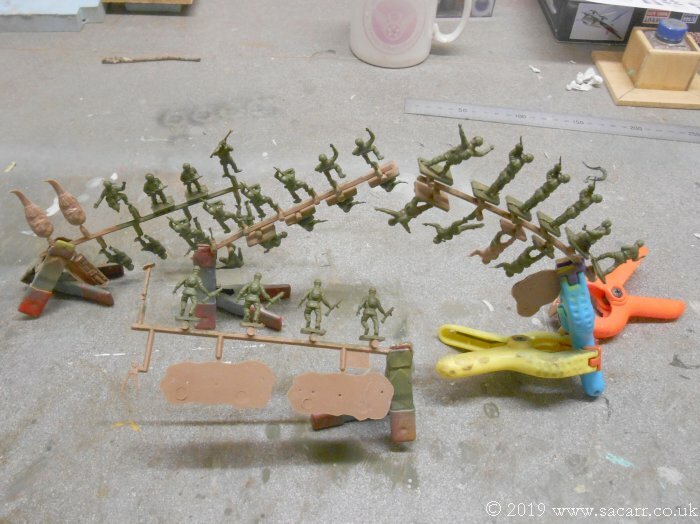 A trial fit showed a reasonable amount of room to get a paint brush in and around the suspension units, so the drive sprocket and rear idler wheel would be left off, but the rest of the wheels and suspension units would be glued. Everything was then left to dry. 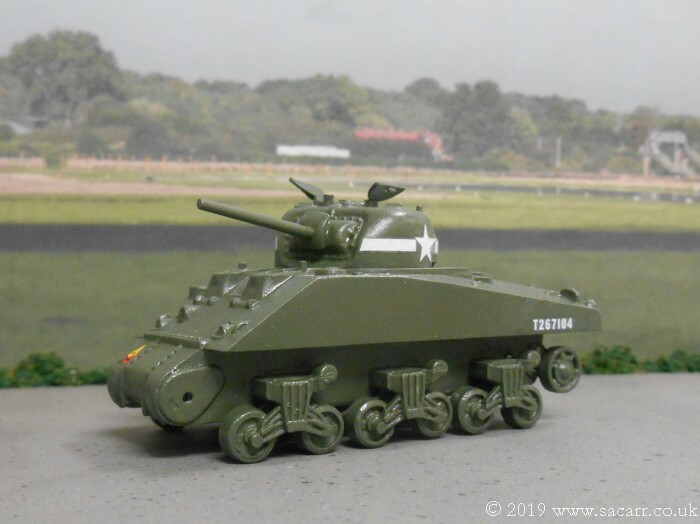 A few of the photos I'd taken were blurred as the camera wasn't on macro, so I went back out to the workshop and took a few more with the tank out of the jig. Further progress was made on December 22nd. As an afterthought, we thought it would be nice to have a couple of crew in the tank. 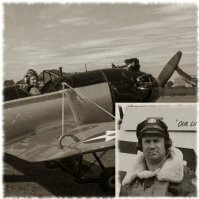 A search through my spares box found a few GI's, a couple of which would do. 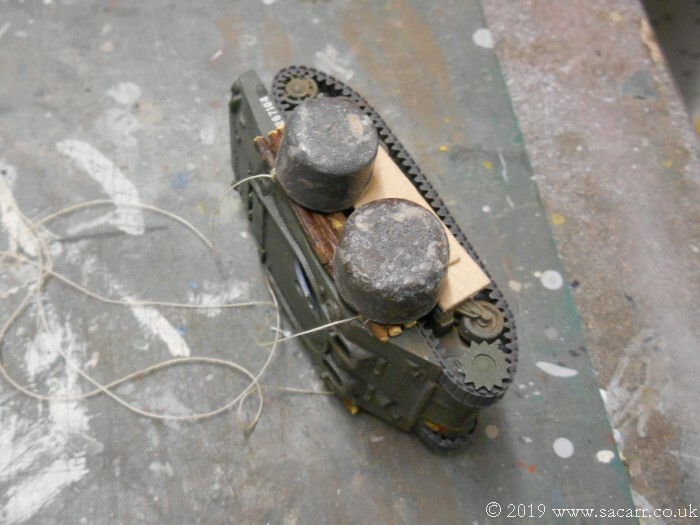 The driver was trimmed a bit to fit in next to the hull, and he was also mounted on a block of acrylic to lift him up to hatch height. 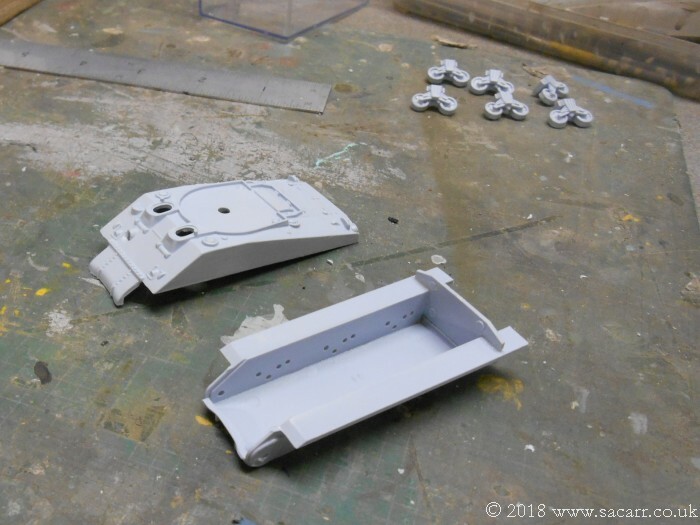 The turret assembly was next. The barrel was the last job of the morning, which was then supported and left to set. I had a nice Christmas cold, starting on Christmas day, which has knocked me out for ten days, so I have managed no modelling over the holiday. 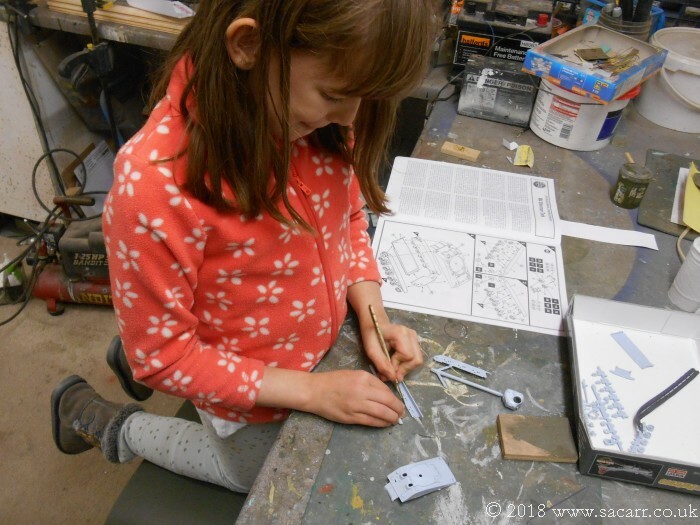 I started to feel a little more human on January 4th, so took my daughter out to the workshop to do some more of the Sherman. 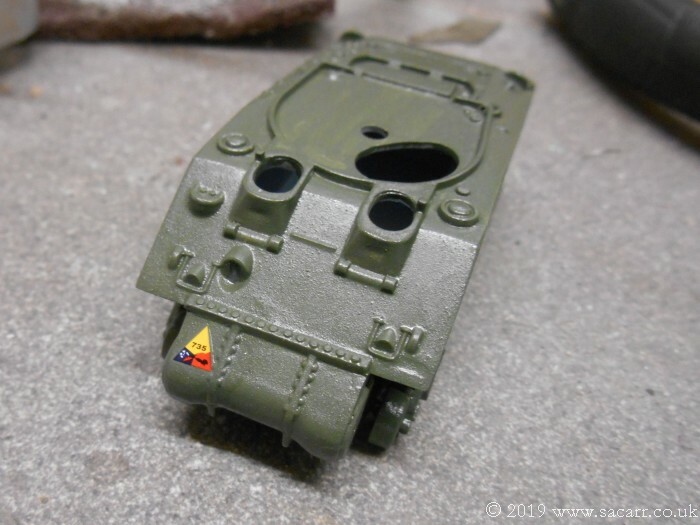 So the next job was to get some olive drab on the tank in preparation for the decals and final assembly. 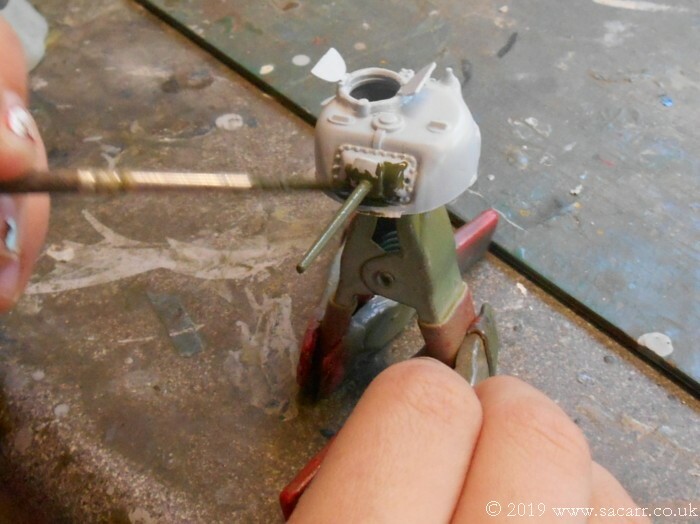 We decided to used the kit acrylics, which up until now, I've hardly ever used except for canopy frames and small touch ups. 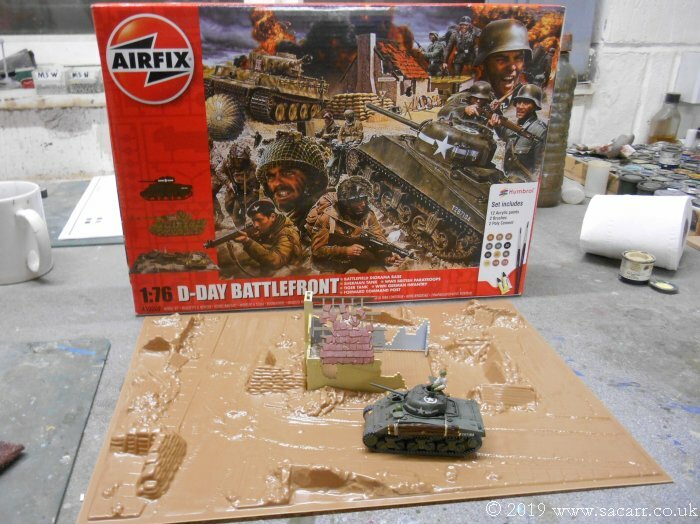 The Airfix acrylics are a bit gritty, but they'll do fine for this. All round the wheels and suspension units were first to be painted, getting all the small fiddly areas done. As well as the suspension, the two separate sprockets were painted. While the suspension was left to dry for a while, we moved on to the turret﻿﻿. 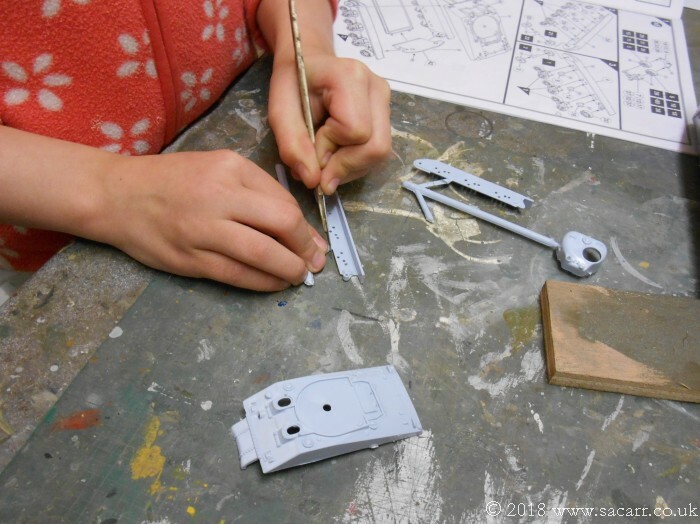 The turret was completed and then we moved back to the hull. Th﻿e hull is now done with one coat. It may need ﻿another coat, but will have a check once it is fully dry. By the time it has been decalled, some additional tree trunk armour added on the side it could be ok. 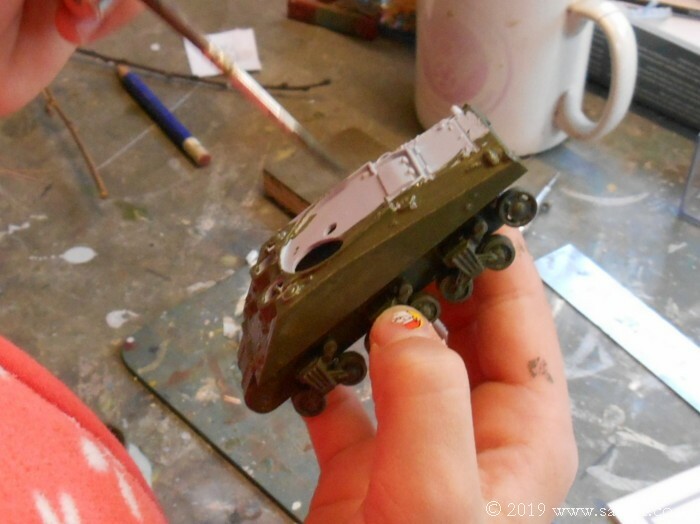 I also want my daughter to have a go at some weathering, perhaps with some washes and some mud added to the wheels and tracks. 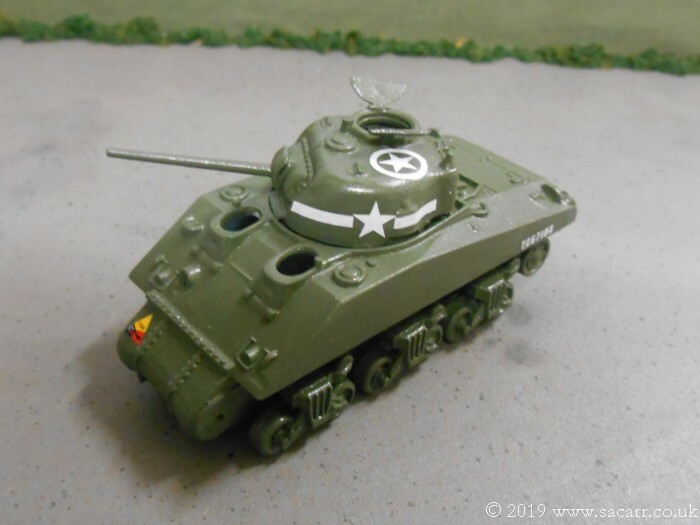 On January 8th, I gave the Sherman a few thin sprayed coats of clear gloss so that it would be dry for our modelling day. After school, my daughter and I did the decalling. She started by applying the division badge on the front. 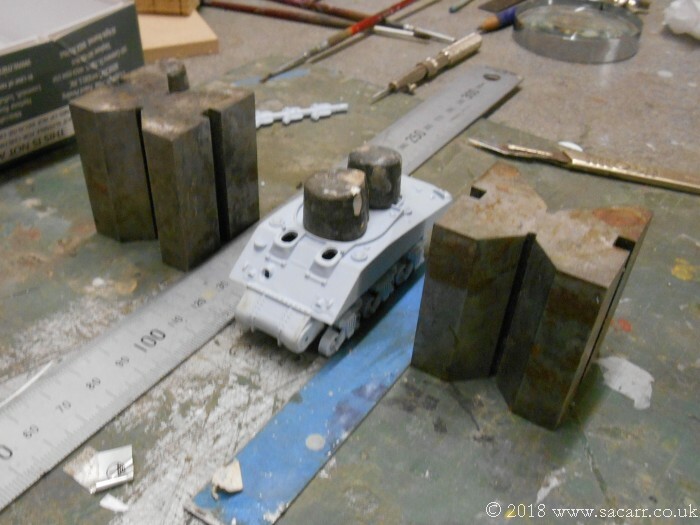 The﻿ hull was then put to one side to allow that to dry a little while and mov﻿ed to the first star on the side of the turret. It took her a little while of sliding it around until we were happy about its location. I try not to interfere t﻿oo much, asking "does that look parallel", "is that the same height as the other side" until she pushes the decal into the correct position. 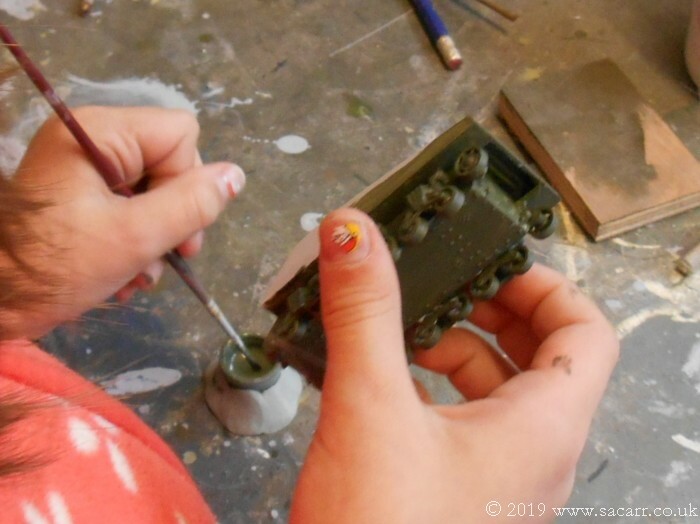 Sometimes she's still a little heavy handed and I give it a micro nudge into place, but generally, she's quite accurate.﻿﻿ I've also been teaching her to use tools such as a brish and tweezers, rather than the fingers I used to use as a child to apply the decals! The turret was then put to one side to dry and the hull brought back to add the registration on the side. I told her to look at the plans and see where the letters lined up with on the tank, such as the last letter directly over the last wheel. That helped with deciding the correct location. 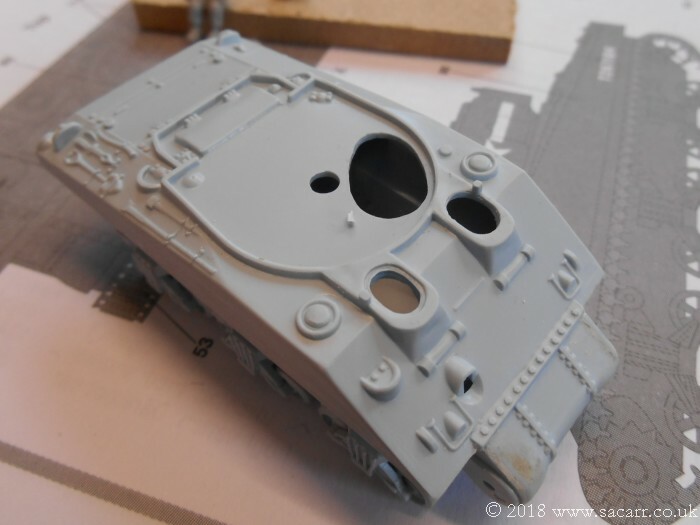 That was left to dry and the turret came back out for the star on the second side. 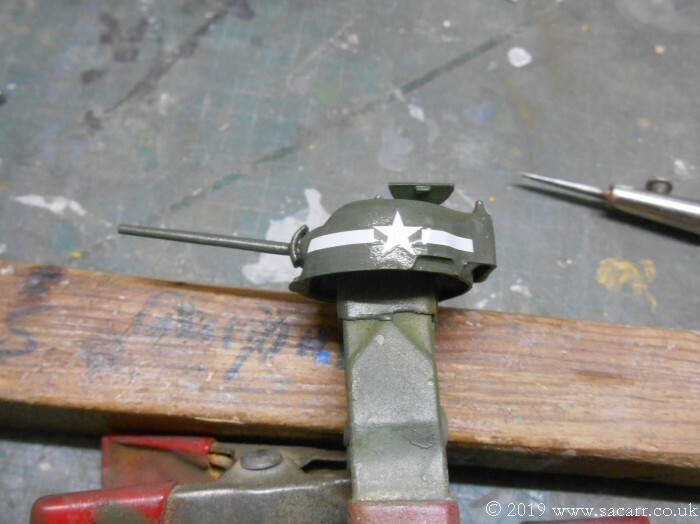 Once both turret stars and both registrations were added, the star on the top of the turret was applied. It was a little more tricky being partially under the commander's hatch. 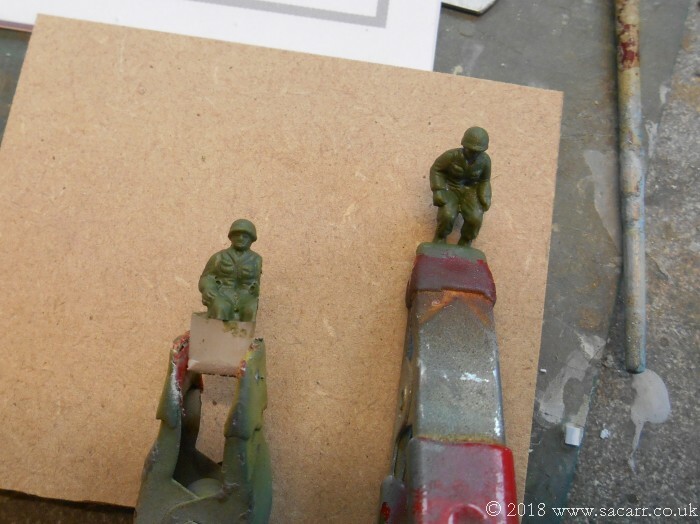 A little Microsol was added to the decals to help them sit down and after that dried, Kevin the Commander and Dave the Driver came to check on the progress. Both were pleased with their new ride! Time for a few more photos. Both the tank crew and my daughter were impressed with how it was looking. 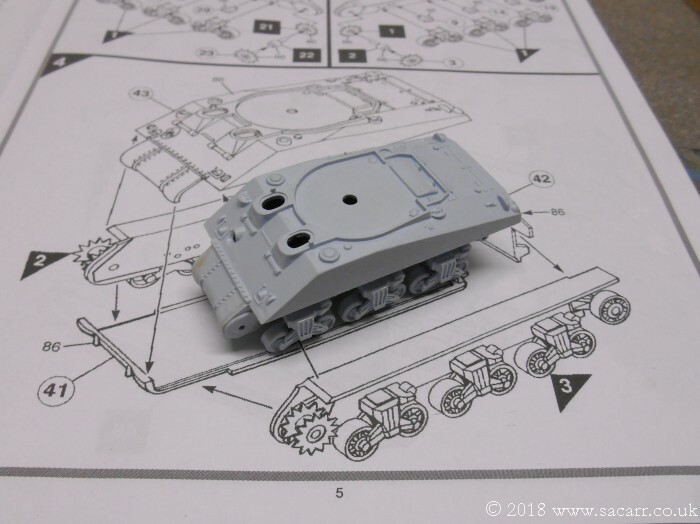 The afternoon was almost over, so we put the tank in a box out of the way for the decals to fully harden and moved on. 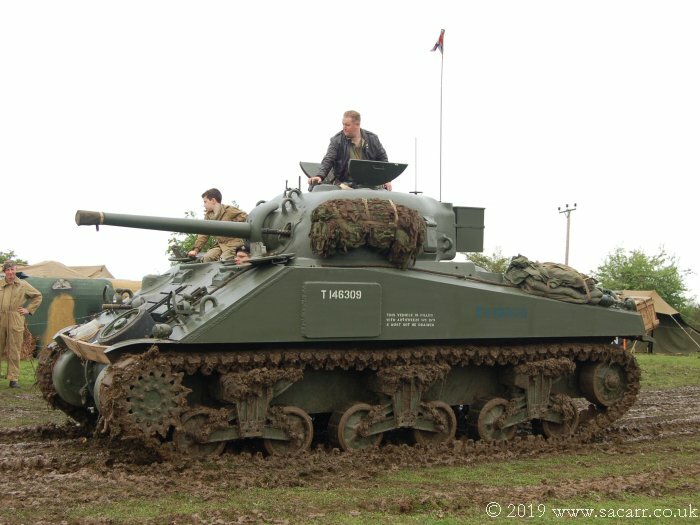 On January 13th, we had a little time spare, so gave the Sherman a couple of washes. The first was a black wash all over. 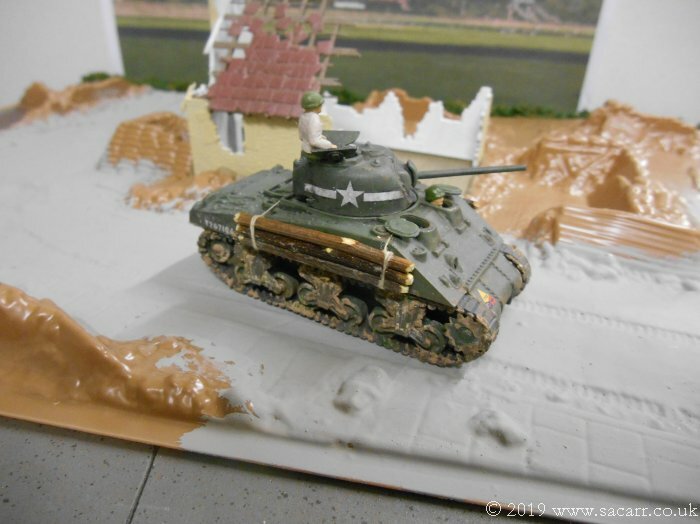 We used the Airfix acrylics, diluted with car screen wash. It was then force dried with a hair dryer. 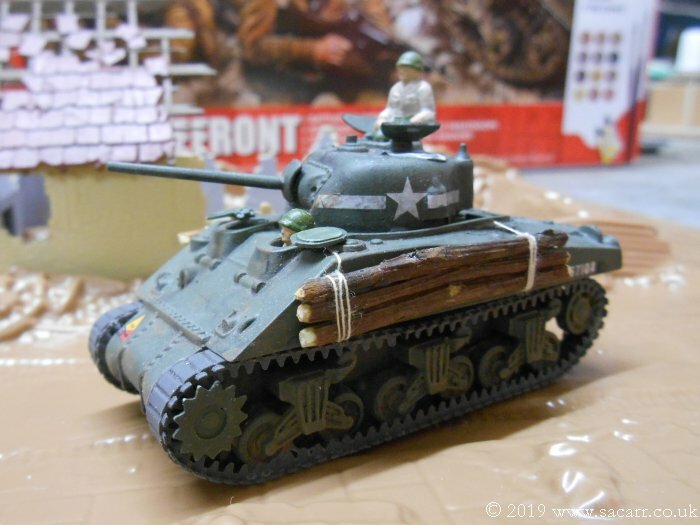 Next came ﻿an earth brown wash over the suspension units, wheels and front of the tank. 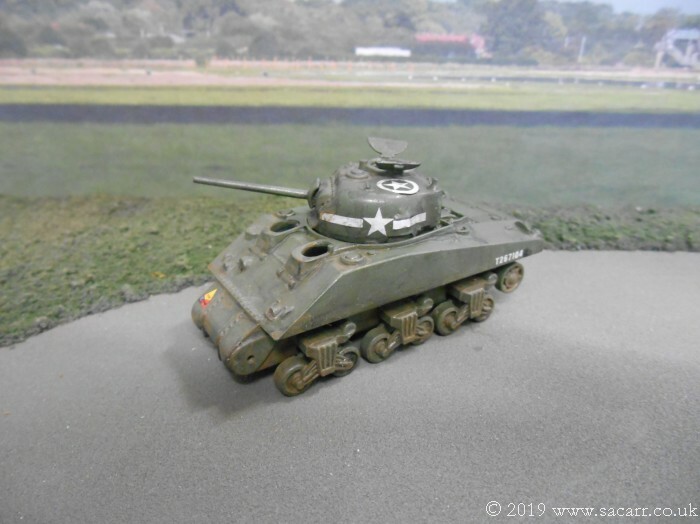 When you ride around in a Sherman on a dusty day, you soon realise how much dust and dirt is thrown forwards f﻿rom the front of the track as it goes around the sprocket. This immediately blows back in your face! 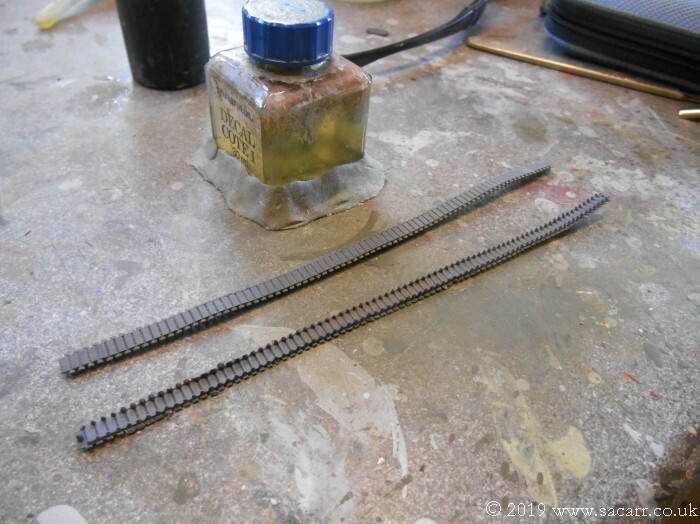 The tracks were given an earth wash too, but we'll add some clumps of mud later, once they are fitted. We're both rather pleased with the way the weathering has come out. It's not far away now. 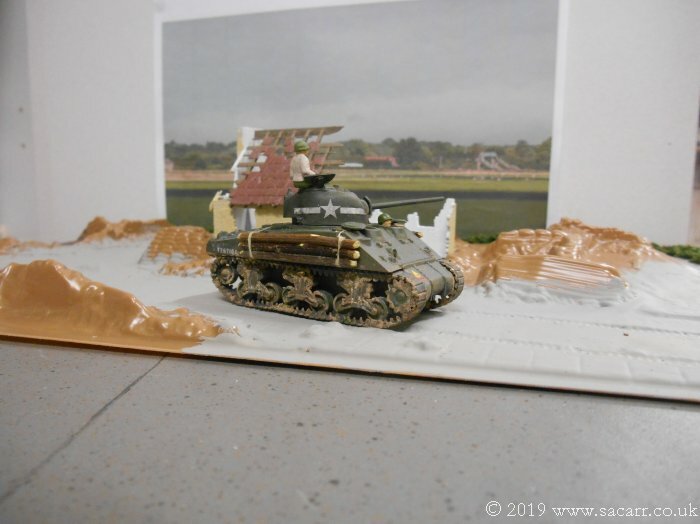 Tracks, mud, hatches, logs, crew and possibly an a﻿erial, although that might wait until the final assembly of the diorama.﻿ The wash has really transformed the look. Wednesday after school is my daughter's normal modelling day, so on the 16th, I did a little preparation while she was at school to allow things to move a little faster once she was home. The twigs that we collected on the way home from school a few weeks ago were cut to length and the ends chamfered to simulate being axed. 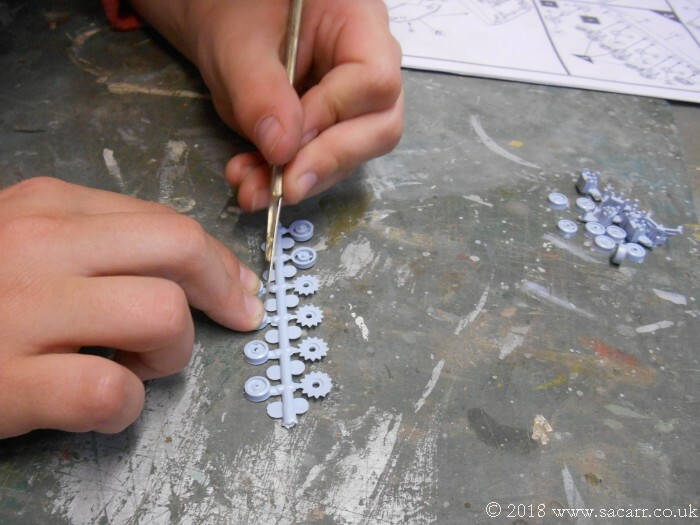 They were then glued together in sets of three so they had time to dry. Kevin and Dave were painted, als﻿o so they would be dry for late afternoon. Dave also had the base drilled and a piece of wire glued in. 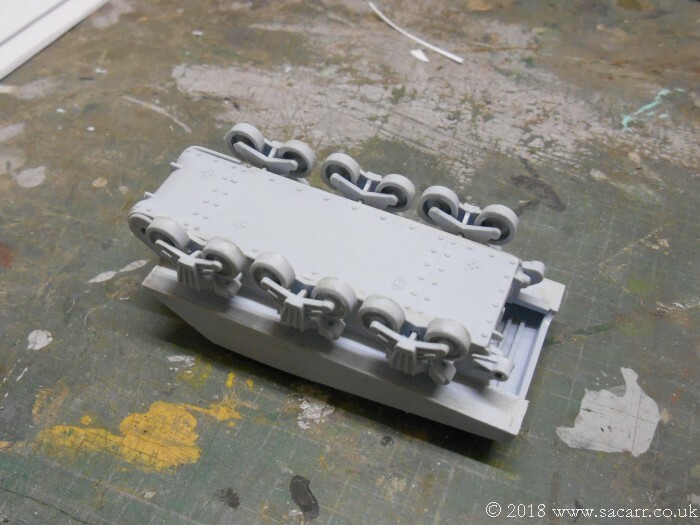 The wire formed a handle to allow him to be fed in theough the hole in the hull and﻿ then positioned in his driver's hatch. 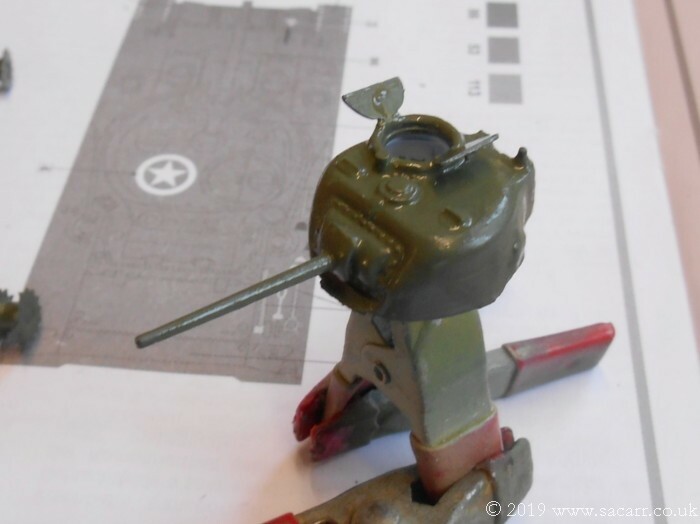 Kevin's backside and thighs were trimmed into a groove to allow him to sit better over the turret hatch ﻿rim﻿. 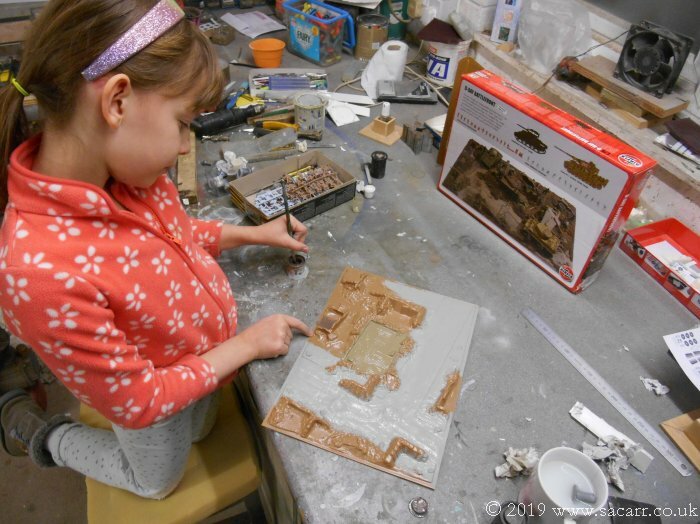 The first job my daughter did tonight was to start assembling the bombed out house, so parts could start drying while we worked on the Sherman. After that, she turned to the logs, now glued into one piece. We used cotton to represent rope to tie the logs on to the tank. 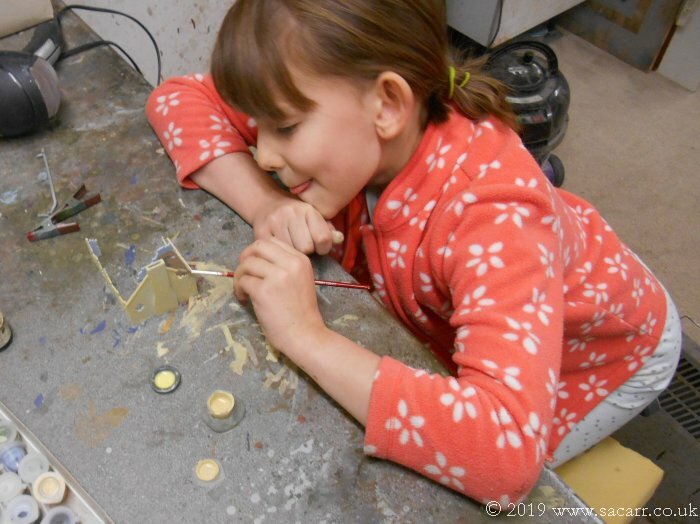 She tied one knot at the top of the stack, adding a tiny drop of PVA glue to hold the first knot. Both ends of each set of logs was roped. They were all left to dry. 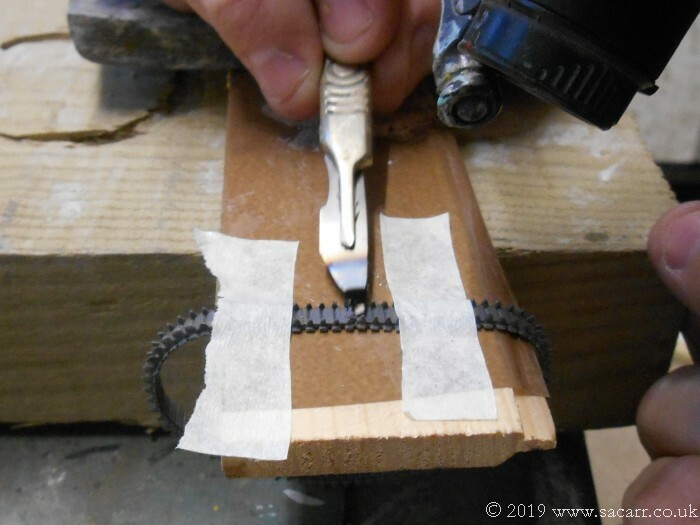 The rubber tracks﻿ were flipped inside out and taped down to a piece of wood for joining. 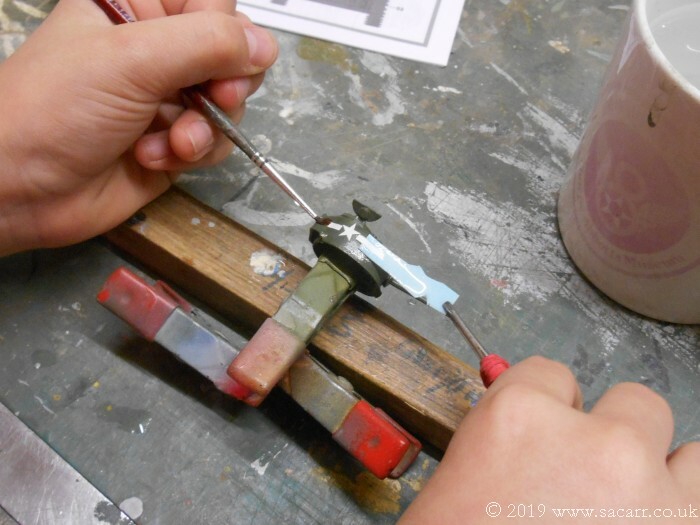 The hot knife method was used for joining them. 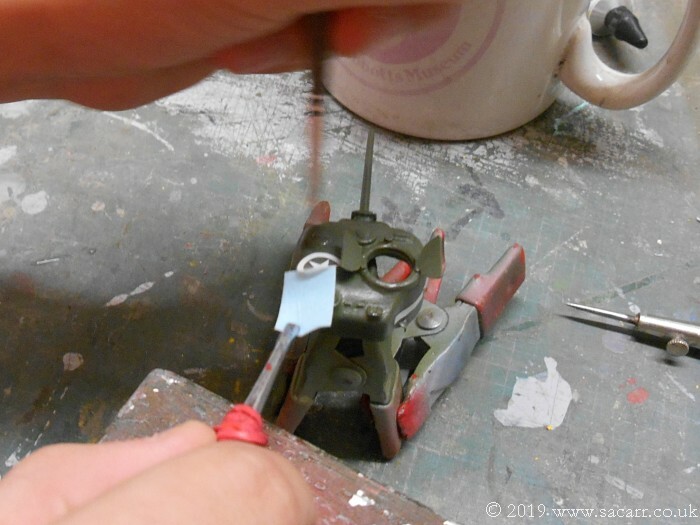 The holes for the sprckets were too small to allow the sprocket to fit, so I gave her a needle file to slowly open up the holes, test fitting as she went. With the tracks attached, the logs were next. 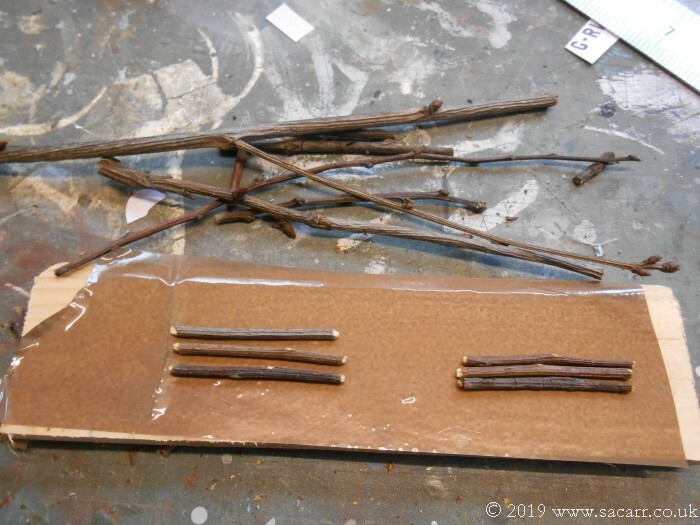 One piece of the cotton thread was wrapped around a couple more times and then glued on the back, before the logs were then glued to the side of the hull. Both sides were done and weighted down while they dried. 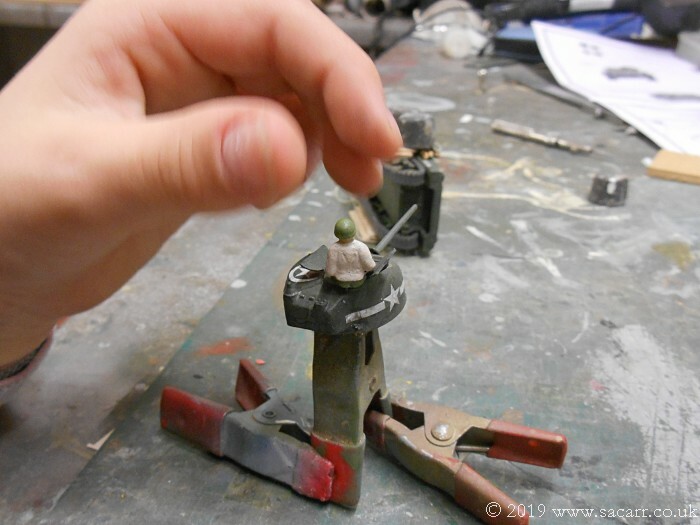 While they were drying, Kevin was glued to the top of the turret. 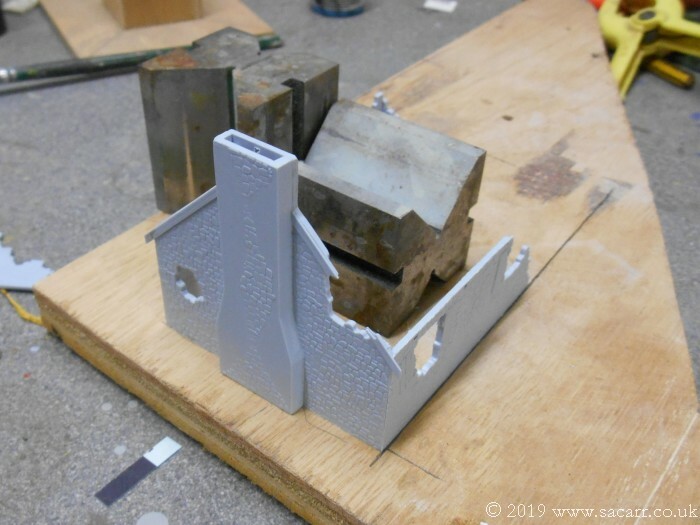 As mentioned earlier, the house parts had been previously cut out. We hopped on and off the house, leaving each wall to dry a while before coming back to add the next one. 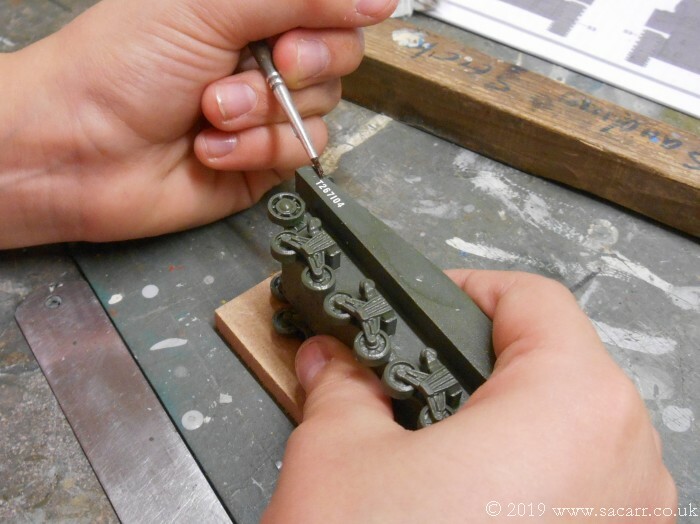 I had a couple of metal 'V' blocks which made it a little easier for my daughter to position and hold the parts while she ran the solvent glue into the joints with a brush. 90 degree lines were drawn onto the wood as a guide to getting the walls square. With all the walls assembled, the floor was glued in. 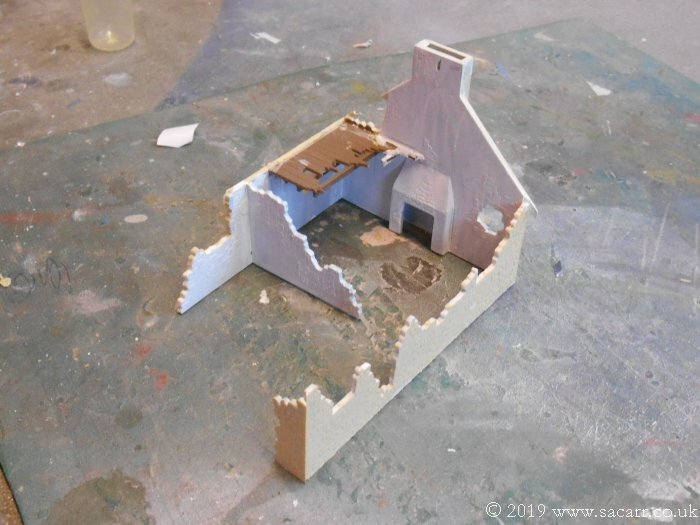 The roof was cut from the sprue and cleaned up, but left off for now to allow easier painting of both the floor and roof parts. With a bit of heat from a hair dryer, the logs were dry enough for a few quick pictures. 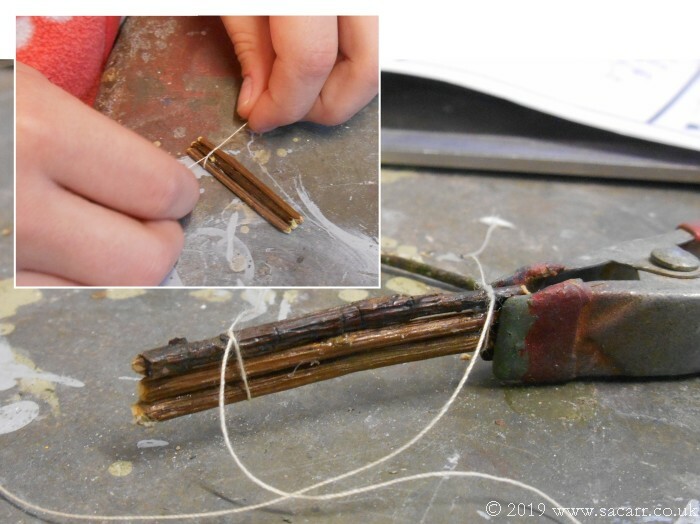 The cotton thread still needs cutting to a suitable length, so for now was just draped over the hull. Time to see the bigger picture. My daughter is very pleased with how it is all looking. 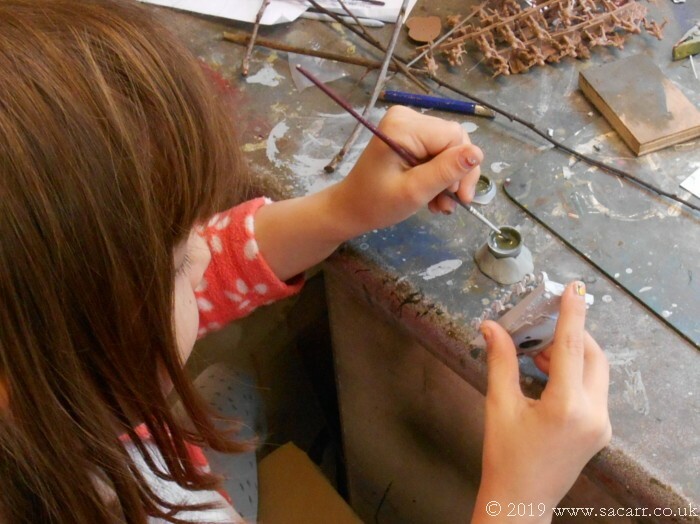 She should be pleased, she's doing a fantastic job - still with lots of guidance and a couple of extra hands from me here and there, but in general, mostly her own work. 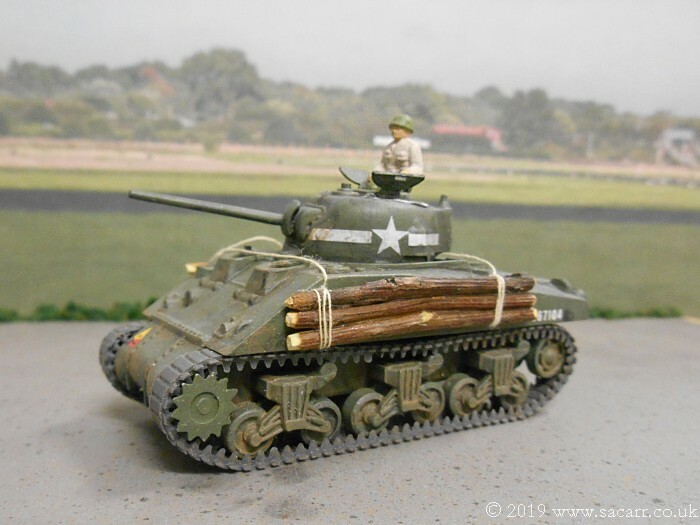 The tracks on the Sherman are a fraction on the long side. 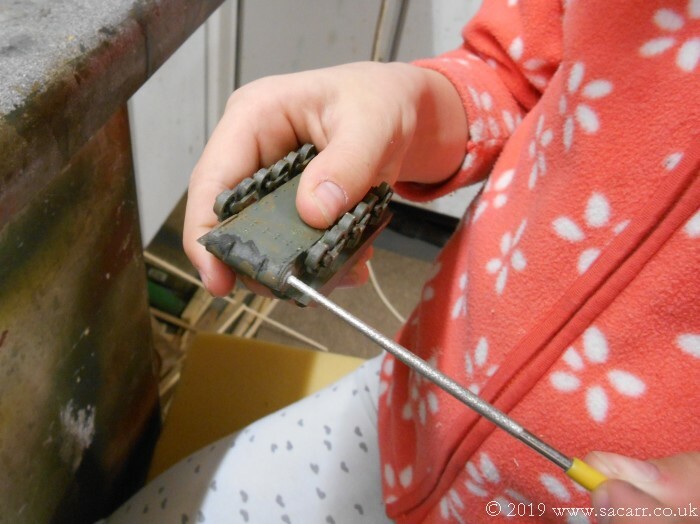 To help to keep them in place, the last job of the day was to add some PVA glue to the lower track and wheels. 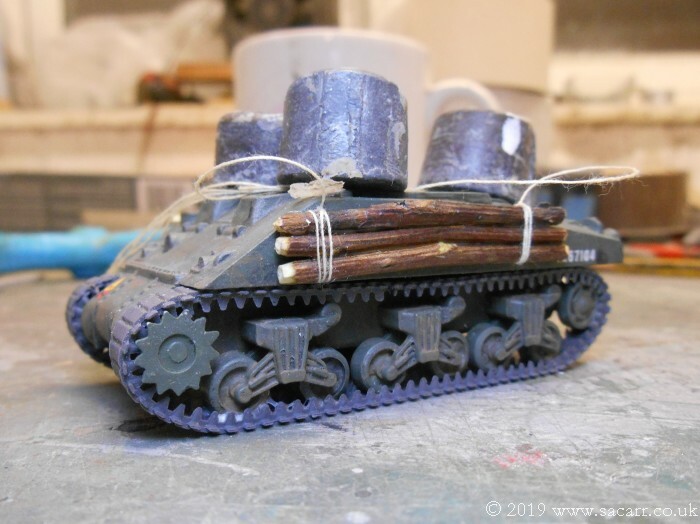 The tank was then weighted down to keep the wheels in contact with the track while the glue dried. 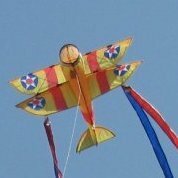 January 23rd and another build session after school. We got the ropes cut down and glued in place and after that, Dave the driver was installed. 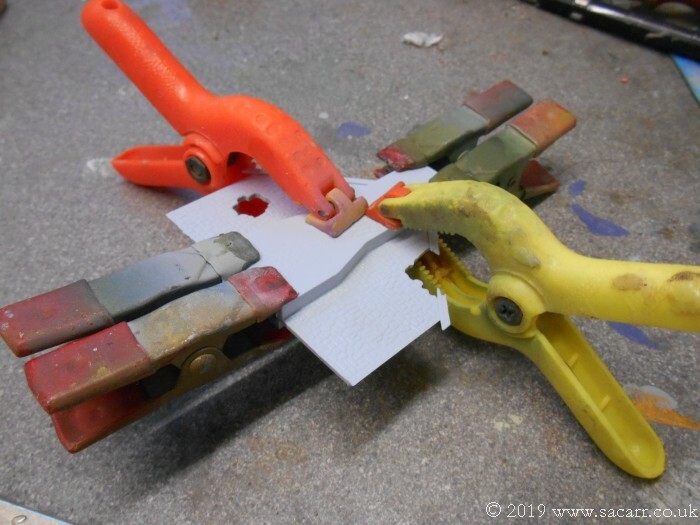 The wire used to install Dave would be trimmed once the glue had a hold. 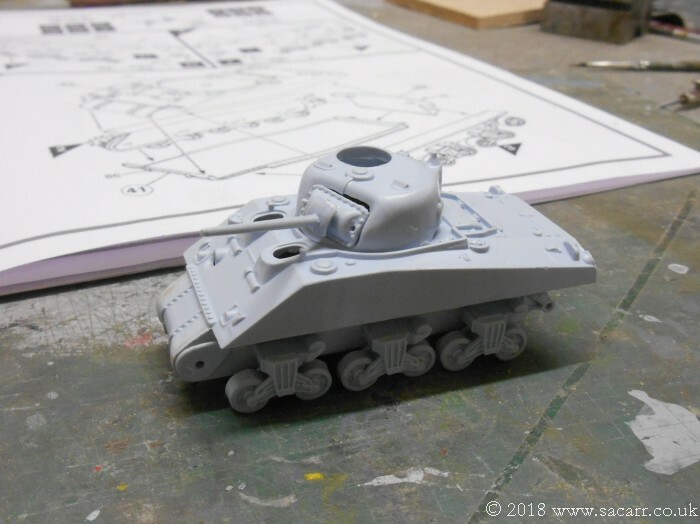 The front hatches were added next. The loft floor was painted a brown for the first shade of the timber planks. 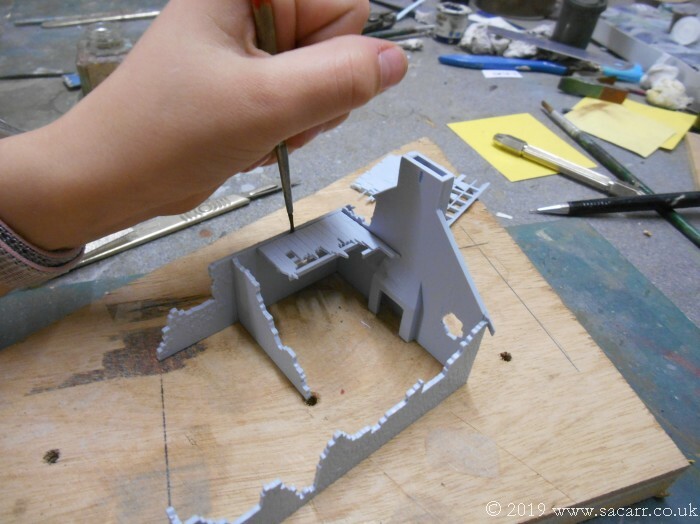 The outside of the walls came next, being painted a base colour for the stone finish. Some of the small wooden crates were also painted. 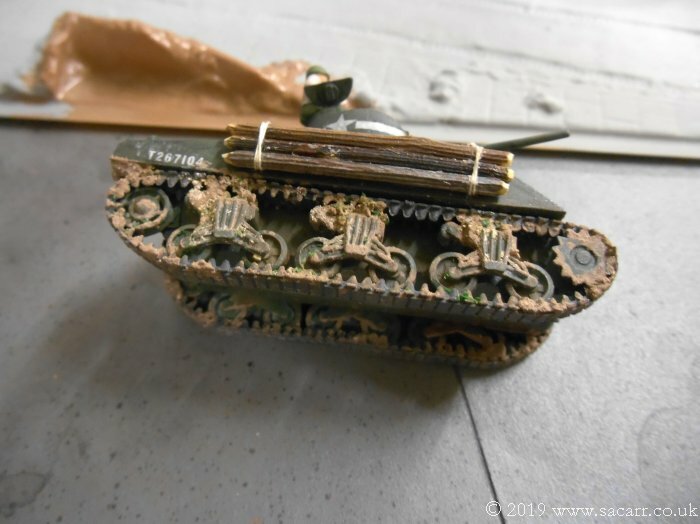 The copper wire on Dave was trimmed allowing the turret to fit, but it won't be glued until the final layout of the diorama is decided. By the time the house walls had two coats and the roof painted, it was 5:30 and time for food. 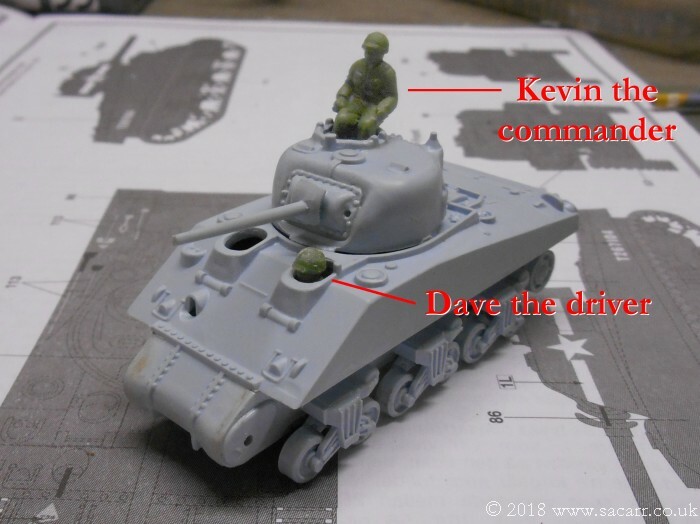 Both Dave the driver and Kevin the commander are very pleased with their new ride. Both are eyeing up the Airfix Jeep box out of shot and are wondering who will be driving that! 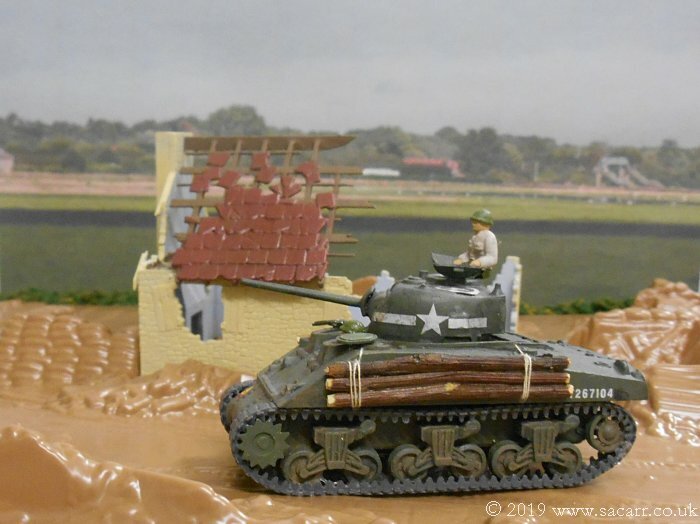 We plan to find a nice country lane somewhere which will make an appropriate background for a photoshoot once the whole diorama is complete. For now, this printed backdrop will have to do. This is the most current update but we hope to make more progress this Wednesday. 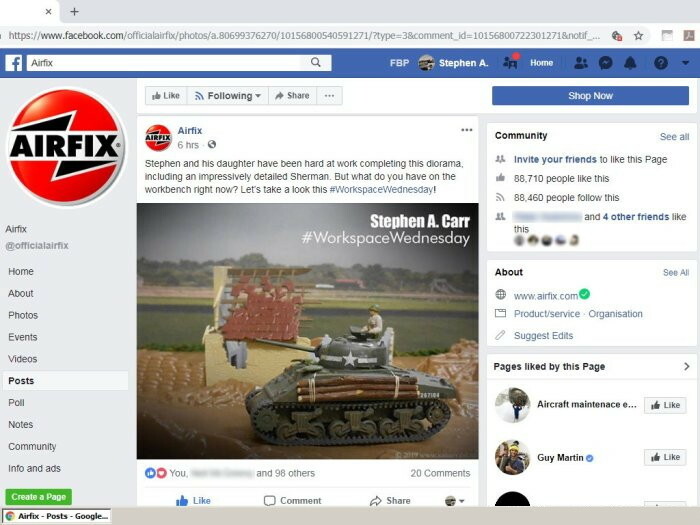 Today was modelling day again, but part way through the day, I spotted we'd made it famous, on the Airfix Facebook WorkspaceWednesday picture. My daughter was rather pleased when she got in from school! The first job tonight was to start painting the interior walls white. 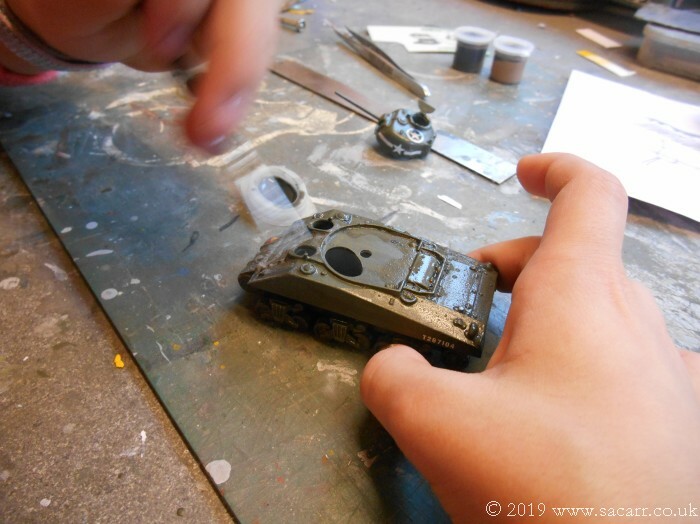 I thinned the kit acrylic and set my daughter painting while I was getting dirty with the tank ( more of that shortly ). She did one coat and force dried it with a hair dryer before applying a second coat. It is seen here after the first two coats. 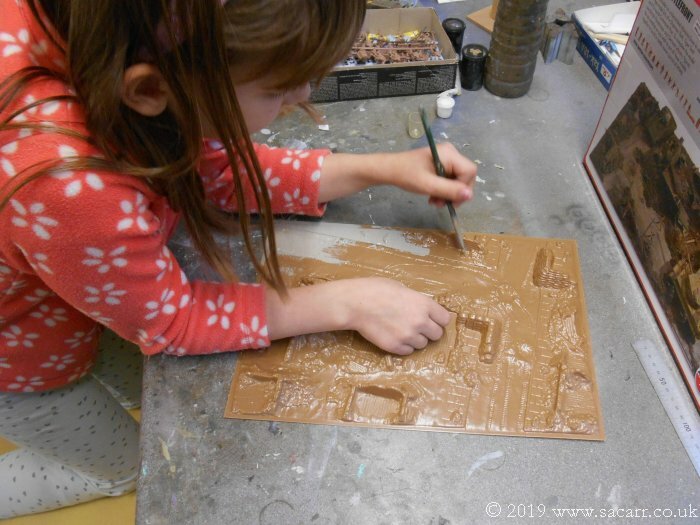 While the second coat of white hardened off for a while over a heater, I set her away painting the base, starting with the road and paved area. She followed that with two different shades of brown for the floor boards of the bombed out house and other destroyed buildings. 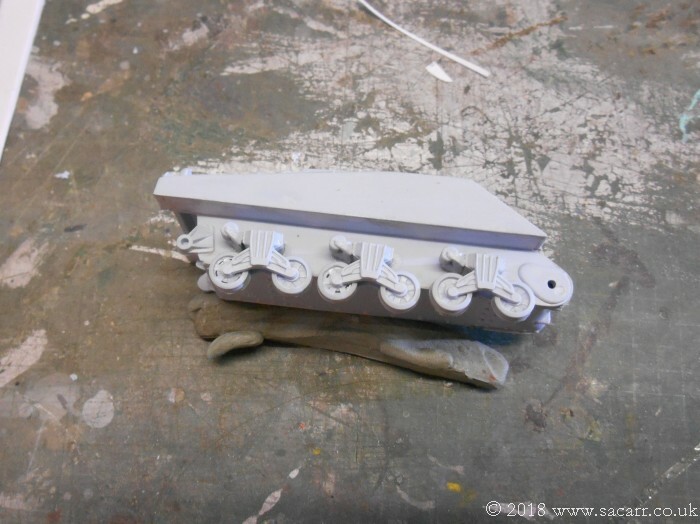 We'll be adding more detail and texture to the base, as some of the vac-formed edges are a bit soft looking for rubble and wreckage. While she did this, I gave the house another couple of white coats and touched up the floor in the house. 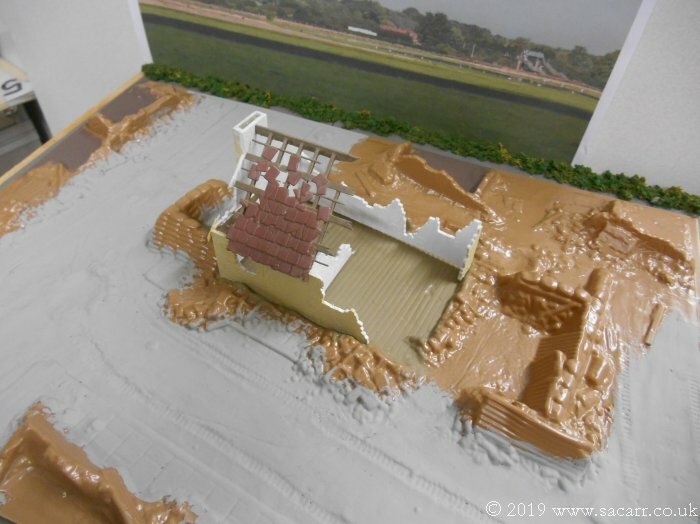 I'd given the roof a sandy wash by this time, and it all looked good with the house on the base. The road needs lots more work yet, but it's beginning to come together seeing some colour on the base. I still need to find some wood to glue the plastic down onto, as the vac-forming is very thin and will be easily cracked. 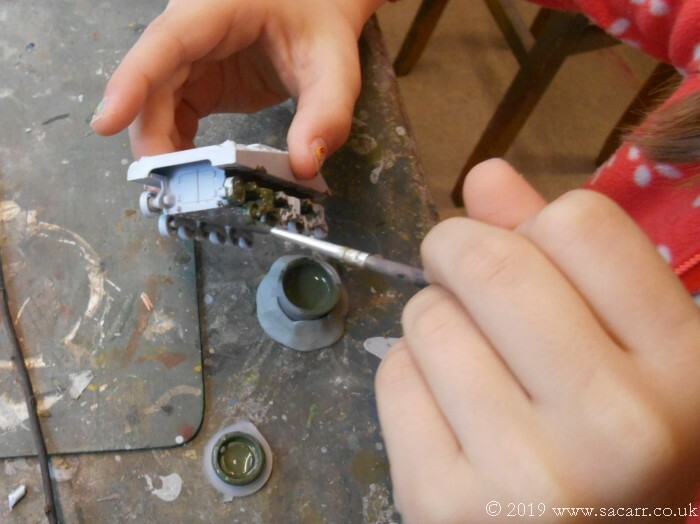 The figures had previously been primed with thinned PVA glue, so today I set my daughter loose giving them a base green coat. 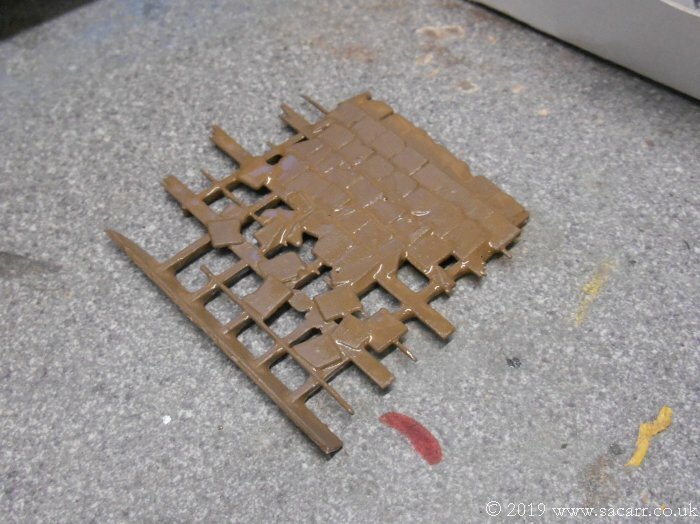 Having the PVA primer made a big difference to the application of the paint. At the start of the afternoon, while my daughter was painting the first white coats on the house, I was studying mud! 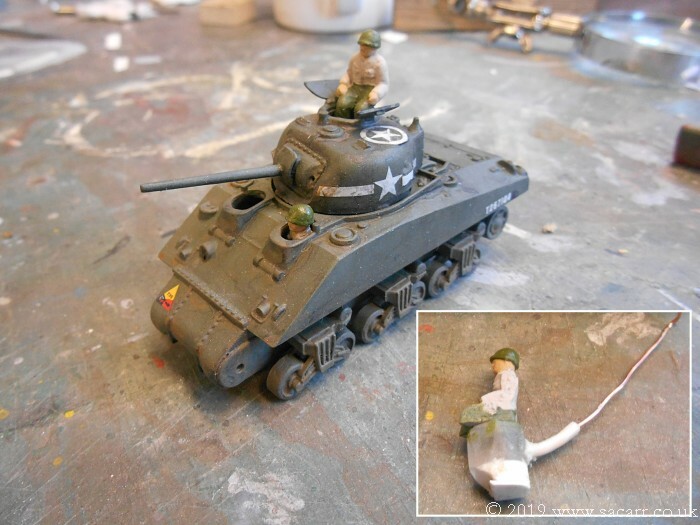 Using Adrian Barrel's M4A4 Sherman as reference ( the one I posted the video of earlier in the thread ), I made notes of where the mud gathered. 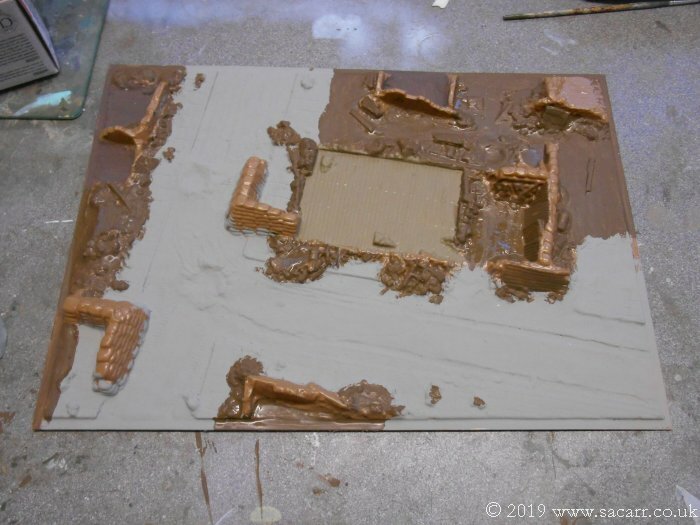 To replicate the mud, I used some first coat wall plaster, dilute PVA glue and earth brown acrylic paint all mixed together. The first coat plaster is quite gritty and seems to work well. 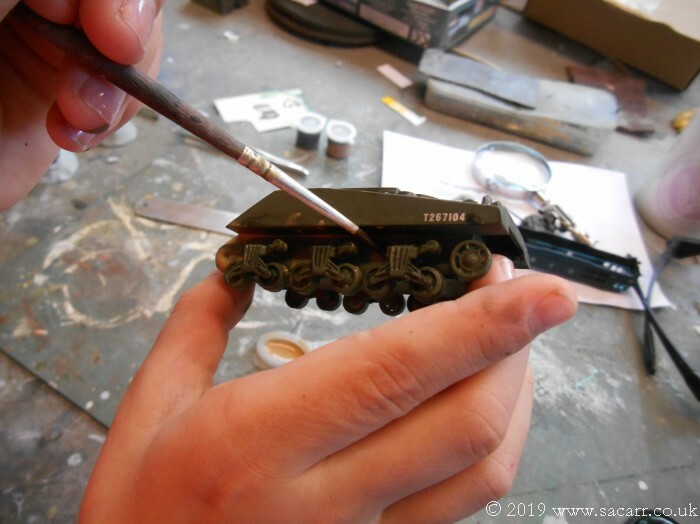 It was applied with a small brush and while all still wet, some model railroading grass powder sprinkled on here and there. We didn't have much time this week so didn't get much done. My daughter got some more base colour painted. This is just an undercoat for further colour and texture. 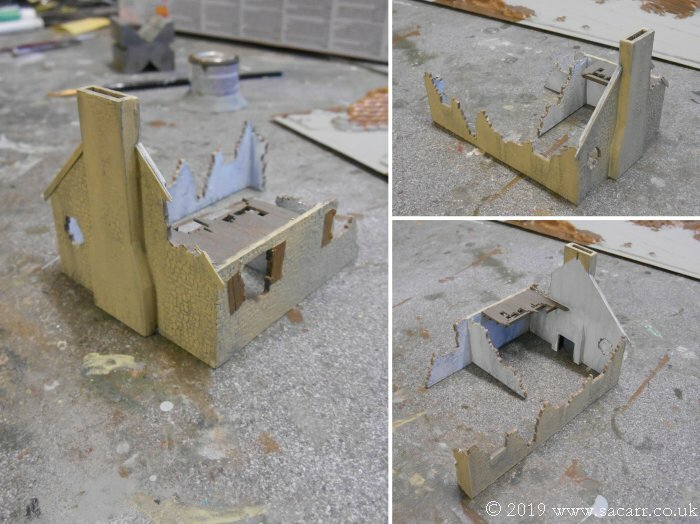 While she was painting the base, I painted the broken edges of the house walls with several colours stippled on. After a quick force dry with the hair dryer, I gave the house walls and wooden floor a couple of washes to tone down the colours and even finish. This is excellent. 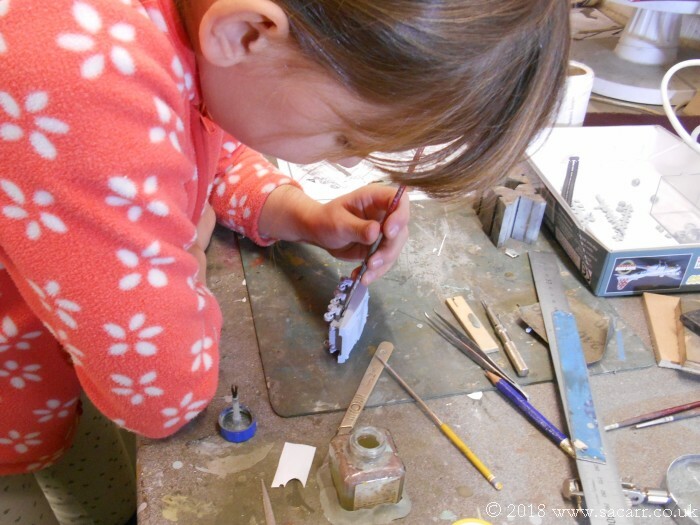 Must be a lot of fun to share the hobby with your daughter. I will be following the progress. Shaping up nicely. 🙂 Do like the retrofit of driver to the hull!